Plug any science topic into the library catalog and you will certainly find a large selection of science books for kids on that subject. But which of those myriad of dinosaur or ocean books will you actually enjoy reading with your child? When you are looking for science picture books to read aloud, you don’t really want a book that is just a pool of facts. You want something with a story, with a bit of humor, even! And you most certainly want appealing illustrations! I have filled this list with what I feel are good science picture books to share with children, not just science fact reference books. 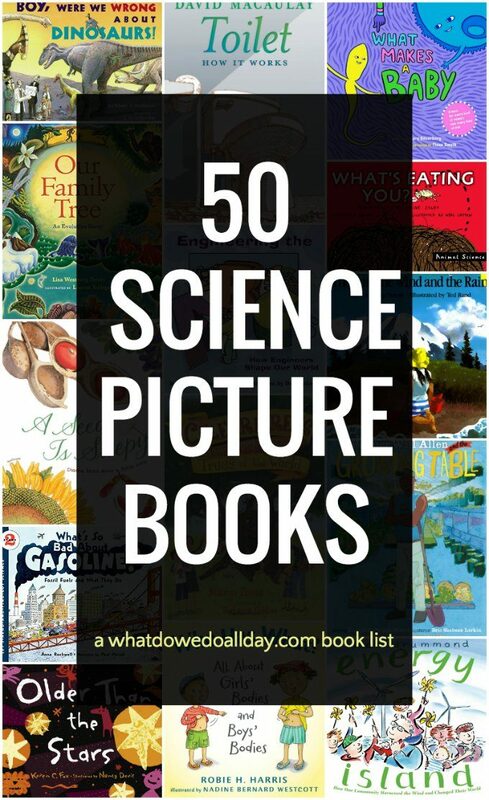 The Common Core standards and STEM/STEAM curricula means there is an increased interest in finding fun, quality non-fiction children’s science books to share in the classroom as teaching tools, but the picture books on this list are great for home reading, too. Because this list is so large, I’ve divided it into 10 well-loved subjects, and given a very brief overview of why I liked each selection. Happy reading! After reading these books, be sure to visit your local Natural History Museum. How Big Were the Dinosaurs? Lita Judge wrote one of my favorite fiction picture books, Red Sled, so it was natural that I would pick up her dinosaur book. I love it. Boy, Were We Wrong About Dinosaurs by Kathleen V. Kudlinski. Remember the Brontosaurus? This book goes beyond just the facts about dinos as we know them now, but how our scientific understanding changes over time. Barnum’s Bones by Tracey Fern. This is a playful look at the man who discovered the first T-Rex, every kid’s favorite dinosaur. Inside Outside Dinosaurs by Roxie Munro. 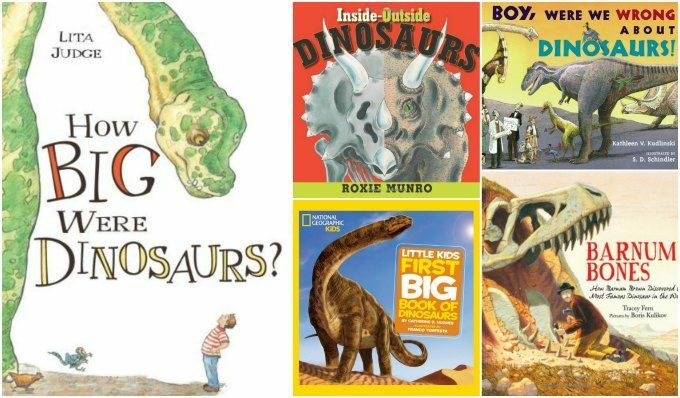 If many of these books seem a bit advanced for your kids, then Inside Outside Dinosaur is a good choice for your preschooler. Munro’s oversized book is simple: alternating pages display the inside and outside of dinos! It’s a perfect read before heading off to your local natural history museum. My First Big Book of Dinosaurs by Catherine D. Hughes is a longer, more in-depth book, but still great for preschoolers on up. Read these books, then plant a garden or visit your local botanic garden! Celebritrees: Historic and Famous Trees of the World by Margi Preus. An interesting look at famous trees and what makes them so special. Farmer Will Allen and the Growing Table by Jacqueline Briggs Martin. A former basketball star turns an abandoned lot into a community garden. This is a great way to teach kids that not all farms need tractors. Secrets of the Garden: Food Chains and the Food Web in Our Backyard. A story of two kids planting and reaping a harvest will encourage kids to become little scientists in their own gardens. Living Sunlight: How Plants Bring the Earth to Life by Molly Bang and Penny Chisholm. Because I am an arts & literature type of person I love science books that describe their subjects in poetic terms. The text is marvelous. I guarantee your will be inhaling and exhaling deeply by the end! Plus, Molly Bang’s illustrations are simply illuminating. A Seed is Sleepy by Dianna Aston. A beautifully illustrated book that makes seeds fascinating! Kids will come away amazed at the complex powerhouses seeds really are! Want even more titles for your space-obsessed kids? 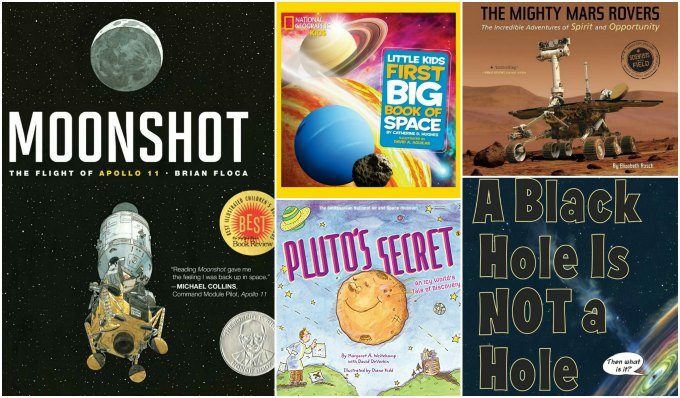 Check out the books on our list of space books for kids. Head over to NASA for up to date science facts! Pluto’s Secret: An Icy World’s Tale of Discovery by Margaret Weitekamp and David DeVorkin. Pluto’s had a rough time of it these last few years. It’s about time he got his own book. It’s a fun and playful story, with loads of facts about the little guy. National Geographic’s Big Book of Space by Catherine D. Hughes. I think I could put a “Big Book” in each of these categories for which there is a relevant title. I usually am put off by books displaying brand merchandising, but this is an excellent series that grows with the child. (Besides, NG is a pretty high quality “brand”.) I recommend it. The Mighty Mars Rover: The Incredible Adventures of Spirit and Opportunity by Elizabeth Rusch. is for ages 8 and up but my younger son loves looking at the photographs. You won’t get any closer to Mars than this book. Moonshot: The Flight of Apollo 11. Brian Floca’s detailed illustrations tell the story of Apollo 11. A Black Hole Is Not a Hole by Carolyn Cinami DeCristofano. For ages 8 and up. This book is so good. It actually made me understand black holes… and made me laugh. Does your child love animals? 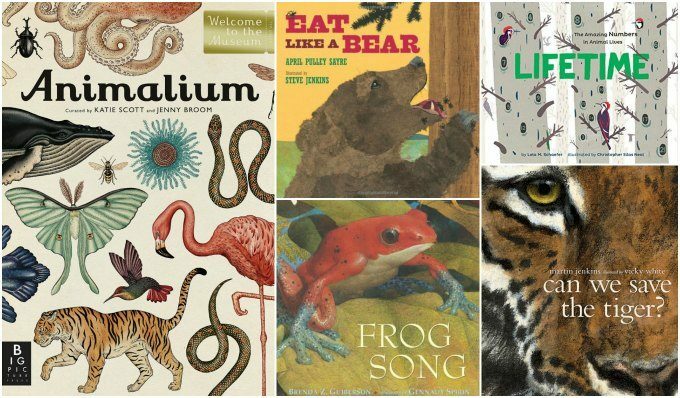 See our expanded list of nonfiction animal books! Frog Song by Brenda Z. Guiberson. Splendid illustrations, splendid onomatopoeic text you can practically feel and splendid facts about these interesting creatures threatened with extinction. Eat Like a Bear by April Pulley Sayre. Little known fact: I really like bears! Share the love of bears with this simple, playful book about how and what bears eat all year long. Includes an end note about different kinds of bears. Great for little ones. Animalium by Jenny Broom. This wonderful oversized book is a fantastic choice for kids who love classification, and those who love the linger at natural history museums. Gorgeously accurate illustrations that evoke nature illustrations of the past take children and curious adults on a tour of of the animal kingdom. Just wonderful. Can We Save the Tiger? by Martin Jenkins More than a book about tigers, author Martin Jenkins examines several extinct species, what led to their extinction, and how we can work to save endangered animals. Lifetime: The Amazing Numbers in Animal Lives by Lola M. Schaefer is a fun look at animals for kids who also love numbers. Earth science covers many topics! 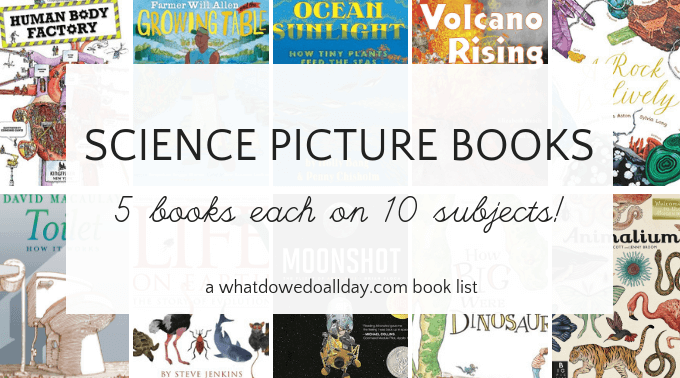 We have a full list of books for kids who love volcanos, earthquakes and dirt! 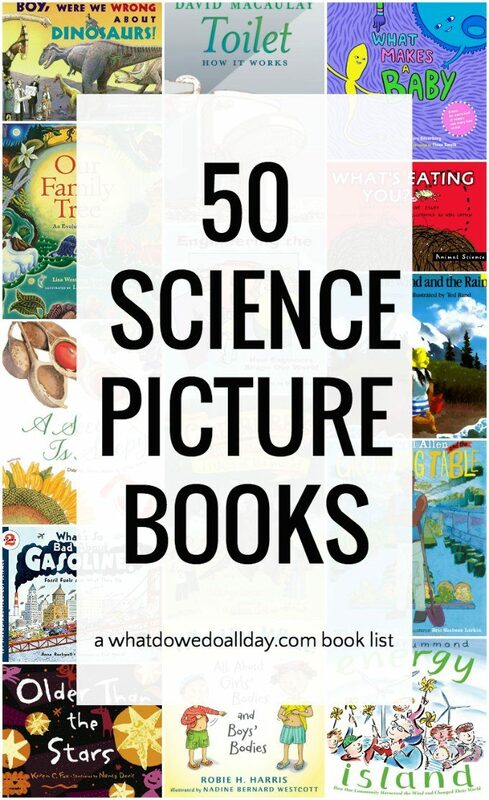 Check out our list of earth science picture books. A Rock Is Lively by Dianna Aston. Kiddo is really into rocks and gems these days. I’m looking forward to when he and his uncle the geologist get together next. He’s been reading books for older kids, but this is a lovely illustrated book for kids just starting out. Volcano Rising by Elizabeth Rusch. A dramatic look at volcanos using paper collage illustrations that will have your kids “hissing” and “pop!-ing” and shouting “volcano rising!” by the end. Grand Canyon by Jason Chin. The story follows a child and an adult on a walk through the magnificence of the Grand Canyon, detailing how the layers were formed, the plants and wildlife that live in the basin. There is so much information here that you and your children will want to read it over and over and then will immediately start planning your next vacation! Planet Earth/Inside Out by Gail Gibbons. This book does exactly what the title suggests: it shows the layers of the earth and how they work together to form an amazing planet. The Sun, The Wind and the Rain by Lisa Westberg Peters. This is a lovely book that uses a child building a sand castle as a parallel to the way mountains form. The simple explanation makes it a good choice for younger children. The world’s oceans of full of mystery, learn more at the National Ocean Service. Your local aquarium is your next stop! Coral Reefs: A Journey Through an Aquatic World Full of Wonder. Once again Jason Chin hits the mark with his awesome illustrations. A girl in the New York Public Library starts reading about the ocean only to find herself swept away on an adventure of scientific discovery. Ocean Sunlight: How Tiny Plants Feed the Seas by Molly Bang and Penny Chisholm. Be sure to read this as a companion to Living Sunlight, above. All the Water in the World by George Ella Lyon is a wonderfully poetic look at the water cycle. Life in the Ocean: The Story of Oceanographer Sylvia Earle by Claire A. Nivola. Science is not just about the elements, it’s also about people. Sea Horse: The Shyest Fish in the Sea by Chris Butterworth. When I was a kid I was a little obsessed with the tiny sea horse. They seemed so magical to me. John Lawrence’s illustrations from wood cuts and engravings perfectly capture that magic. 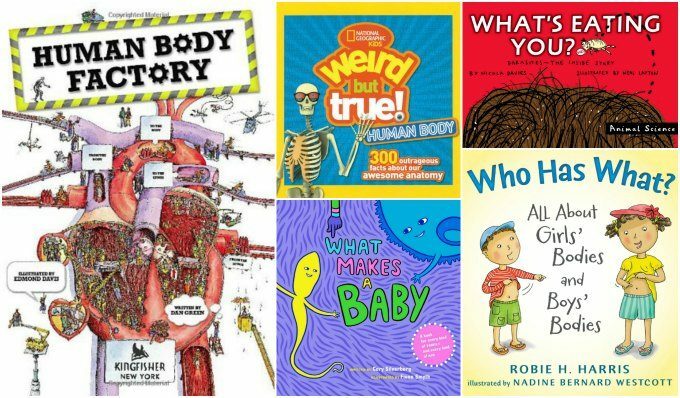 All children want to know more about how their bodies work. These biology books will start to satisfy their curiosity. Who Has What? All About Girls’ Bodies and Boys’ Bodies by Robie H. Harris is an excellent book for kids who are starting to notice that not everyone is the same. The Human Body Factory: The Nuts and Bolts of Your Insides by Dan Green is for kids ages 7 and up who like books with lots of little information blurbs! What’s Eating You? : Parasites — The Inside Story by Nicola Davies. Moms will be grossed out, kids will be riveted. Weird But True: Human Body: 300 Outrageous Facts about Your Awesome Anatomy. National Geographic does it again. Be prepared for your children to tell you all sorts of interesting science facts at the dinner table. What Makes a Baby? Cory Silverberg. This is a not-dumbed down version of how things work but it is entirely age appropriate. Plus, it’s a celebration of families. Excellent. 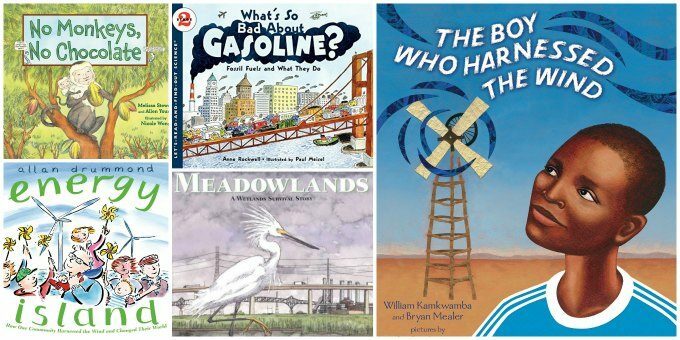 These science picture books cover subjects like energy usage, environmental damage and recovery, and the impact of human actions on the environment. Energy Island: How One Community Harnessed the Wind and Changed Their World by Allen Drummond. Hold onto your hats. The story of how the Danish island of Samsø became completely energy efficient will inspire your kids. Meadowlands: A Wetlands Survival Story by Thomas F. Yezerski was a particularly interesting book for my kids since we live close by. I’m quite pleased that the name “Meadowlands” is no longer synonymous with football in their minds! What’s So Bad About Gasoline? by Anne Rockwell. In general, I find the “Let’s Read and Find Out” series of leveled science books to be an excellent series. You will easily find them at your local library. My son found this to be a fascinating book. It’s a good start to learning about fossil fuels. No Monkeys, No Chocolate by Melissa Stewart & Allen Young. is an interesting look at how monkey behavior is integral to the continued existence of chocolate. This is a great conversation starter about the interconnectedness of life on earth and how important it is to maintain balance in the environment. The Boy Who Harnessed the Wind by William Kamkwamba mixes social studies, engineering and environmental issues. Learn how a fourteen year old changed his community. Evolution is a fascinating topic and many schools don’t cover it comprehensively. Lead your children down the path of scientific discovery with these wonderful evolution science books! Island: A Story of the Galápagos. Jason Chin’s marvelous illustrations tell the story of evolution on “Darwin’s Island” from its geological beginnings to the present. Fascinating. Older than the Stars by Karen C. Fox. I love, love, love this book. Like several other books on this list it has a sort of “double text”. You can read the large text straight through as a story to younger kids, but the sidebars will interest older kids looking for answers to their burning questions. This beautiful look at how the universe evolved ties all living things to the beginning of time. Lucy Long Ago by Catherine Thimmesh is for kids ages 8 and up. It is a fascinating look at the discovery of “Lucy” in 1974 by paleontologists and how it changed the way we view our human ancestry. There is a lot of information in this book but it’s very approachable (even for grown-ups like me!). Life on Earth: The Story of Evolution by Steve Jenkins is a kid-friendly approach to a huge subject. You can read a little or a lot of this book because each page has small asides about various animals or evolutionary traits. Our Family Tree: An Evolution Story by Lisa Westberg Peters is a good book to explain a complicated subject to kids ages 4 and up. The increased attention on STEM topics means that learning about engineering science is trendier than ever! 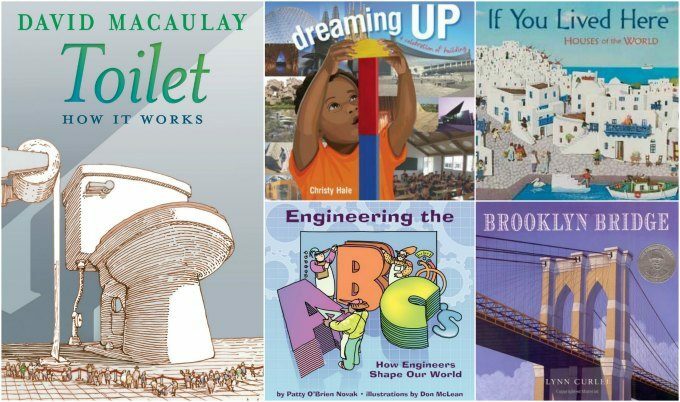 Keep up with the Joneses with these engineering-themed picture books. If You Lived Here: Houses of the World by Giles Laroche is a combination of architectural science and social studies. Brooklyn Bridge by Lynn Curlee. It’s true that we have a teensy-weensy bias towards books about New York City. Can you argue, though, about the awesomeness of this bridge? This book is not just about engineering science of the bridge, but the history of the time, the persons involved, and it contains stellar illustrations, maps and diagrams. Dreaming Up: A Celebration of Building by Christy Hale. Kids at play mirror great feats of engineering around the world. Fantastic for preschoolers. I definitely would have put this one on my list of picture books for little engineers and inventors had I discovered it earlier! Engineering the ABC’s: How Engineers Shape Our World by Patty O’Brien Novak. Teach your kids ages 4 and up about all the ways engineers contribute to the world. fantastic list – thanks a million, I’ve just ordered two! Yay! I’m so glad it’s helpful for you. Enjoy the books! Wow, Erica! I LOVE the wide variety of subject matter you have here! Such a great collection of books 🙂 Thanks! Thank you! I really tried to make it useful and interesting and focus on picture books that weren’t just dry texts. Great books- and I love that your list is heavy on the poop theme, my personal favorite topic. I think some of these may sway my kid away from only wanting to read superhero books. I’m thinking I will need to make that poop book list after all! This list is awesome. Something to pin and look back at in the future. I have completely gotten into non-fiction picture books because of the challenge at Kid Lit Frenzy. I think it might be rubbing off on my daughter as well since she brought 2 non-fiction books about birds home yesterday from school. Thank you, Michelle! Enjoy the books! I’ve seen that one, but I haven’t read it yet. Thanks for the recommendation. I’m glad you like the list and thank you for the suggestion. I’ve never heard of that book. I bet my boys will love it. Great list! So excited to see illustrators Jason Chin and Elizabeth Zunon on the list. I have read a number of these books, but there are several I need to check out. Many thanks. Thank you, Miranda. Enjoy your new finds! You are welcome! I’m so glad you found the list useful. This is SUCH an awesome list Erica. I am all set for 2014 Non Fiction reading 🙂 thanks for sharing it on Kidlit Bloghop this week.. I put this on my Pinterst board! We don’t read much non fiction so I will have to try some on your list for my son! Thank you for such an extensive list! Thanks so much for joining us for the Kid Lit Blog Hop too! I love that there are so many picture books focusing on science! The first book I published was a picture book about the moon; we included an illustration of the Solar System and “Tanner’s Moon Journal of Moon Facts.” It should be our goal to get kids excited about learning! Thanks for this list of books!